Northern Georgia predominantly mountainous, dotted with numerous small towns, fascinating historic sites, and national parks and forests. Among the highlights of this region are the New Echota State Historic Site (the last capital of the Cherokee nation), Chickamauga at Fort Oglethorpe, and Jasper, where the marble quarries produced the marble used in Washington, DC. Also worth seeing is the Blue Ridge Scenic Railway, at the end of the Appalachian Highway, and the spectacular Tallulah Gorge near the town of Clayton. 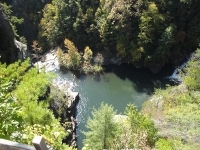 The northwestern Georgia region offers hundreds of wooded hiking trails, sparkling trout streams, scenic lakes, and camp sites. Most of the towns and attractions are within an hour's drive of Atlanta, making them perfect day trips or weekend breaks from the city.